You are here: Home / Blog / Travel / Italy / Sold! 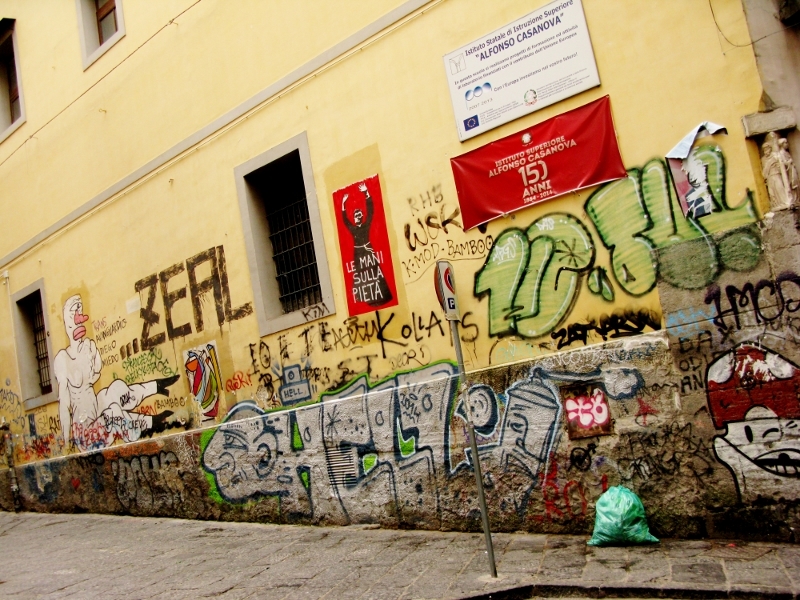 Grubby, dirty, and graffitied to within an inch of its life, Naples is a city you’ll either love or hate. There are no half-measures. I knew this even before I came, such was the degree of polarity expressed by friends who’d already visited with more hating it than loving it. I had zero expectations and these expectations were more than met. I’m in the LOVE NAPLES camp – love it so much that were it not for the complete absence of any sort of order, I’d even consider moving there. And perhaps I might, in time, even get used to the chaos. It’s a dirty city. The streets are littered with cigarette butts and beer tops. Bins overflow. Every wall within writing reach is covered in graffiti – not the Bansky type though; more of the ‘I wuz ‘ere’ banality that gives the art a bad name. Not even churches are spared. In fairness, there is the occasional gem, but for the most part, it’s names and dates and monosyllabic words. Grime aside, it’s full of life with a tangible energy that makes it vibrate. The locals, who by all accounts consider themselves Neapolitan first and Italian second, take an inordinate pride in their city and there’s no quicker way to please than to tell them how much you love it, too. We stayed in the Old Town, Centrico Storno, on Piazza Bellini. 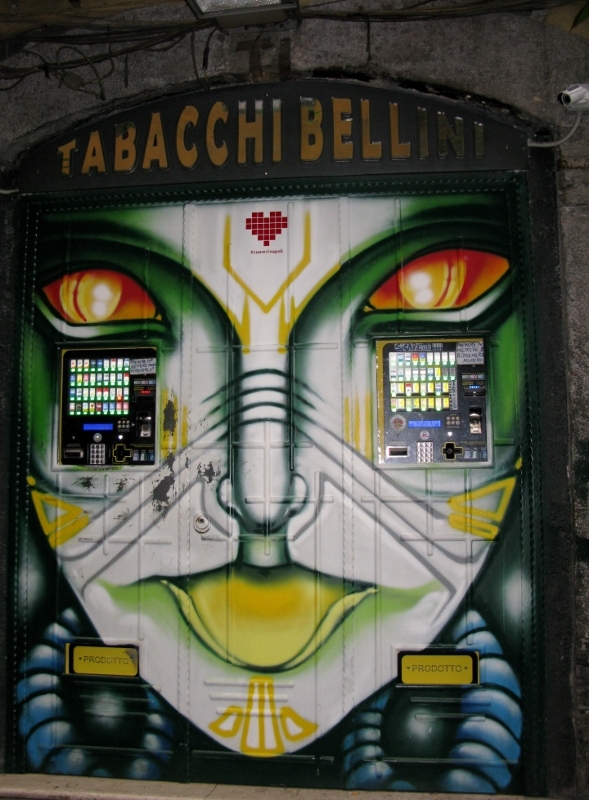 It’s a favourite hangout of Napoli football fans and at night, people spill out of the tiny bars onto the streets in what at first seems like a loud, rambunctious melée but in actuality is just the locals having a good time. All are drinking, few are drunk. The roofs and bonnets of parked cars double as tables and although it was chilly enough, tables inside were empty – the street is where it’s at. Now that’s something I doubt I could get used to. My standing around days are over. 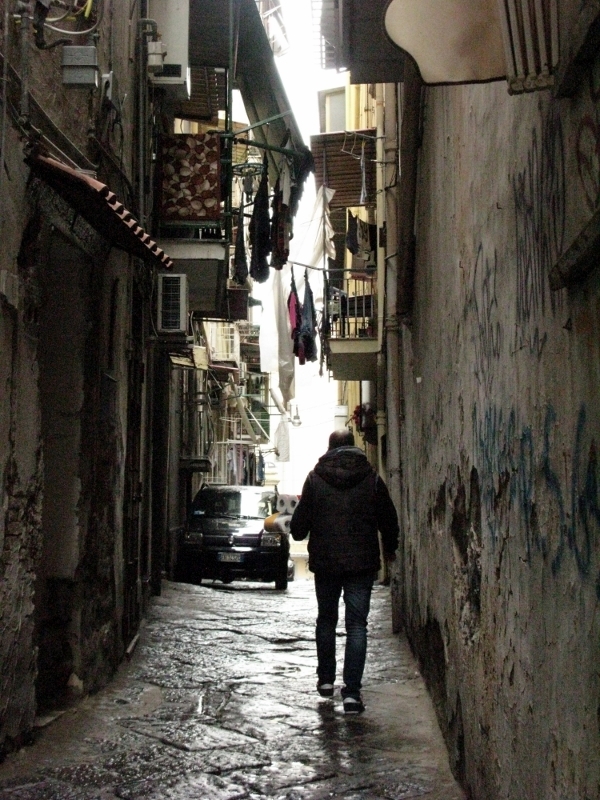 Naples was once Europe’s second city, after Paris, a description it’s long since lost. While its people are beautiful, their style is more urchin cool than catwalk. They are a law unto themselves and patterns of behaviour, if there are any, are not easily discernible. Queues don’t exist. Social propriety, or the absence thereof, borders on an appearance of rudeness. There is no holding back with opinions [shop assistant to me: your pronunciation is soooooooooo bad]. And what they want takes priority [Waiter to me: Just order a pizza. We are busy]. In some places you pay immediately; in others you pay whenever the humour takes the waiter, regardless of whether or not you’re finished; and in more still, you might be waiting all night before you can find someone to give your money to. 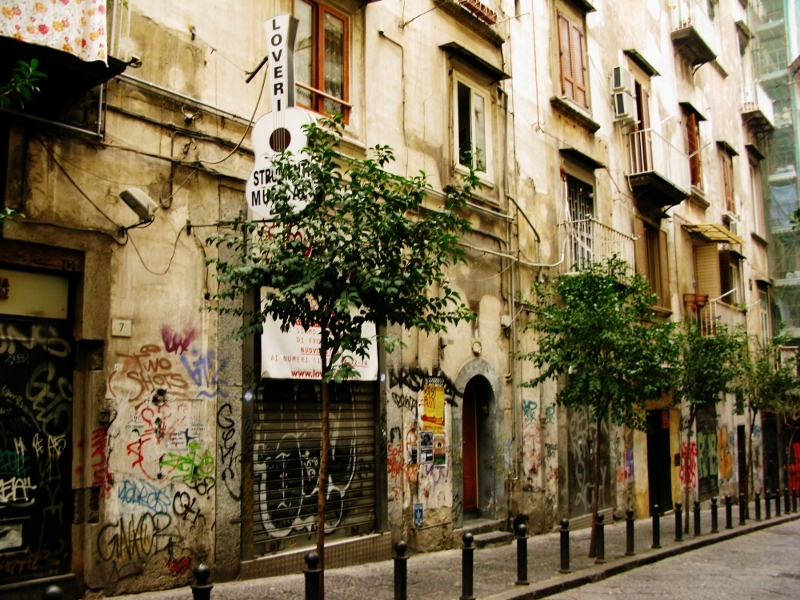 They like blanket pricing and a little consistency – all drinks, be they alcoholic or not, are €2.50 or €5. With coffees and drinks paired with nuts, crisps, pastries, bruschetta, and the odd ham and cheese sambo, you could quite happily go about your day without ever having a proper meal. But when you do – it has to be pizza. 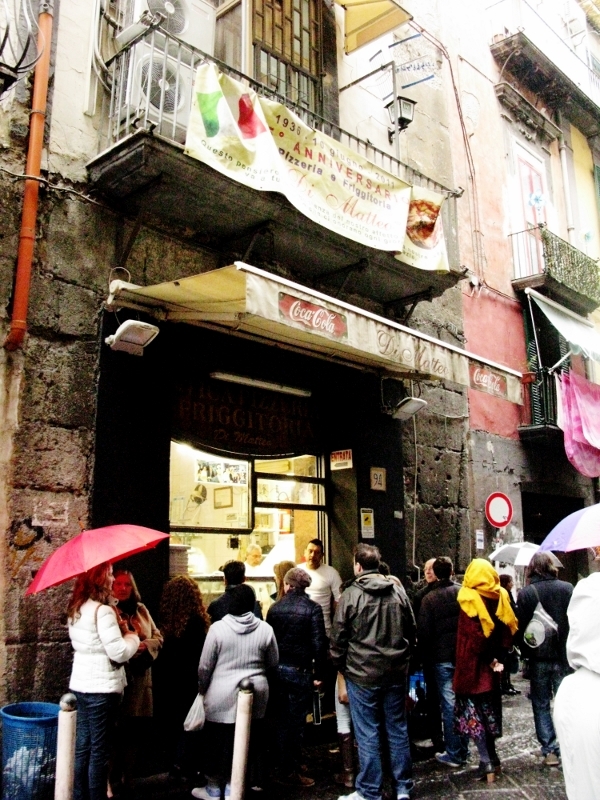 The home of the Margarita, Naples is famous for it pizza – that is something everyone I spoke to recommended to do. Eat pizza. And the toppings are generous and exotic. But the opening hours are hit and miss. No patterns. So take it when you can get it. It’s narrow medieval streets are strung with laundry, that had one either the time or the inclination to ‘read’ would speak volumes as to who lived inside. Given the small cars and vespas that drive at breakneck speed through the veins of the city, it’s a wonder that the laundry is ever clean. There are many police, many different uniforms. 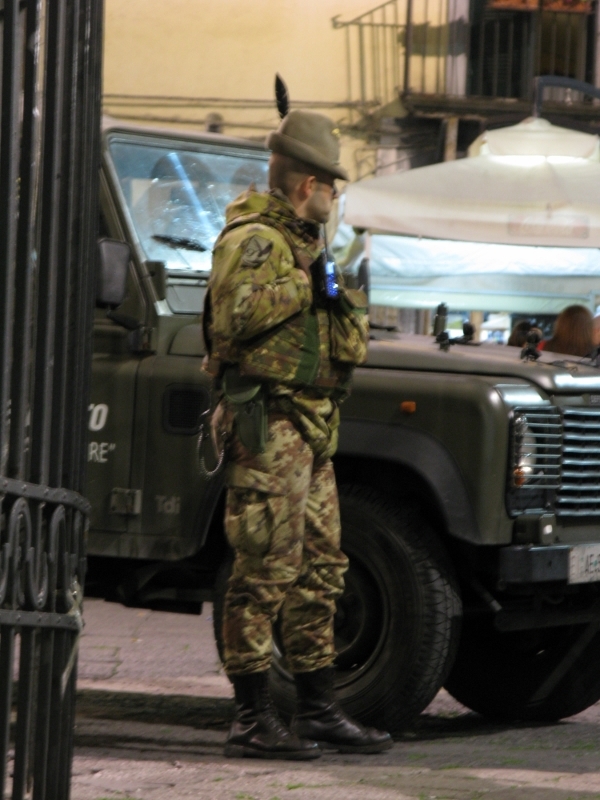 Italian policing has to be as convoluted as it comes, with state, provincial and municipal police to name just three. In Naples, one particular lot fascinated. A weird mutation of Captain von Trapp and General Patton – it was hard to know whether they’d shoot or yodel. We had three days and based on accounts from others who had been before us, we all set to desert the city and head to Sorrento or Pompeii or up the Amalfi coast. But we never made it outside the city limits. Naples – a great city with so much to offer. Should I ever get tired of Budapest, that’s where I’d head to next. https://unpackingmybottomdrawer.com/wp-content/uploads/2017/06/logo-300x82.png 0 0 Mary Murphy https://unpackingmybottomdrawer.com/wp-content/uploads/2017/06/logo-300x82.png Mary Murphy2015-03-25 09:02:502017-03-14 21:51:55Sold! Endemic informality! You sound really enthused – but I thought you were going to Paris, or is that next? I’m in Helsinki, waiting for the snow to stop . . .
Next stop, Bernard. Next stop. Vibrant and interesting city ……….yes I agree but there are plenty of ‘dark’ areas. Northern Italians are reluctant to visit! I once swam in the sea off Naples, I couldn’t understand why there should be so few people swimming (just some street kids) when the water was so blue ,clear and warm. Later, on a train, I asked a fellow Italian passenger……he struggled with his English but eventually managed to spit out the word typhoid and together with trying to be sick that’s what I was doing for the rest of the journey! Great travel writing. I loved this piece. I have to say you’re a gifted travel writer. Ever think of a book?